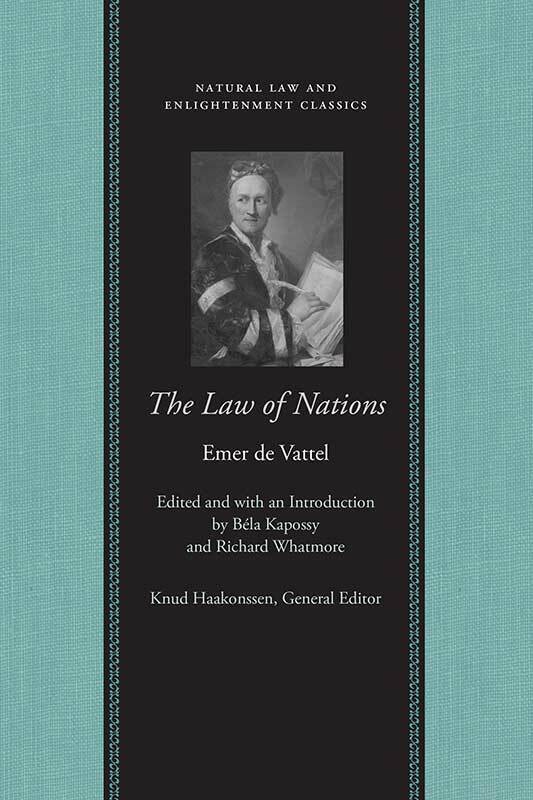 The great eighteenth-century theorist of international law Emer de Vattel (1714–1767) was a key figure in sustaining the practical and theoretical influence of natural jurisprudence through the Revolutionary and Napoleonic eras. Coming toward the end of the period when the discourse of natural law was dominant in European political theory, Vattel’s contribution is cited as a major source of contemporary wisdom on questions of international law in the American Revolution and even by opponents of revolution, such as Cardinal Consalvi, at the Congress of Vienna of 1815. The significance of The Law of Nations resides in its distillation from natural law of an apt model for international conduct of state affairs that carried conviction in both the Old Regime and the new political order of 1789–1815. The Liberty Fund edition is based on the anonymous English translation of 1797, which includes Vattel’s notes for the second French edition (posthumous, 1773). Emer de Vattel (1714–1767) was a Swiss philosopher and jurist in the service of Saxony. Béla Kapossy is Professeur Suppléant of History at the University of Lausanne. Richard Whatmore is a Reader in Intellectual History at the University of Sussex. Introduction, note on the text, annotations, biographical sketches of authors referred to by Vattel, bibliography, index.